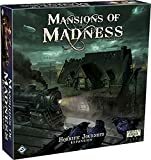 Mansions of Madness is a cooperative game. All players are on the same team and win or lose the game together. The investigators' ultimate goal is to explore the scenario's map and piece together the evidence and clues required to solve the mystery. In addition, investigators need to overcome various challenges, including fending off terrible creatures, befriending non-player characters, and solving puzzles. 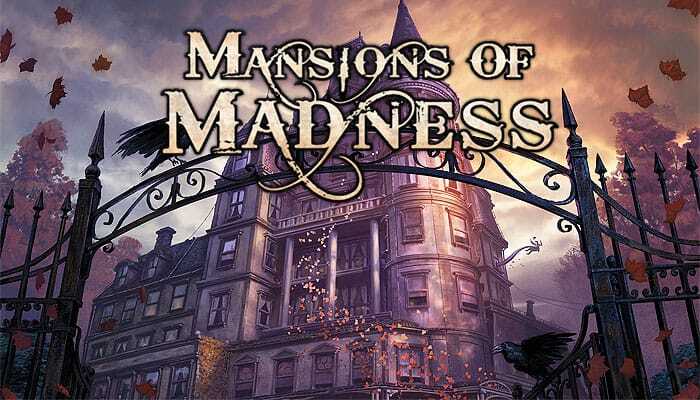 To download the Mansions of Madness app, search for Mansions of Madness on the Apple iOS AppStore, Google Play store, or Amazon Appstore. Alternately, you can download the app for Mac or Windows from our website at FantasyFlightGames.com. Separate the Investigator cards from all other cards. They will be used later during setup. Then separate all other cards into decks by card type. Shuffle the Damage and Horror decks individually and place them facedown within reach of all players. Organize the cards in the Common Item, Unique Item, Spell, and Condition decks alphabetically and place them faceup within reach of all players. This will make it easier to find cards when they are needed during the game. Gather all map tiles and organize them by tile size. This will make it easier to find tiles when they are needed during the game. organize monsters Make sure that each monster figure has a matching token slotted into its base. See "Monster Figure Reference" on page 22 of the Rules Reference. Separate all tokens into pools by token type. 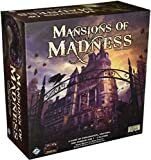 Run the Mansions of Madness app and press "New Game". 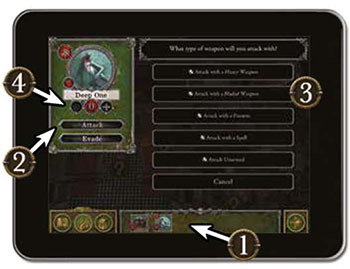 Players, as a group, decide which story to play and input their selection in the app. Each player chooses an investigator, taking the Investigator card and figure for that investigator. Then input the selected investigators in the app. Hereafter, players will be referred to as "investigators". If playing with only a single player, that player chooses two investigators and controls both of them. Unused Investigator cards and figures are returned to the game box. Investigators, as a group, gain the specific Common Items, Spells, or other possessions as instructed by the app. These possessions may be distributed among the investigators however they decide. Perform the remaining steps of setup as instructed by the app. Read aloud the scenario's prologue as shown by the app. The story's prologue might provide hints about what is to come. Place the starting map tile and Investigator figures as instructed by the app. Place Search tokens, Explore tokens, and other tokens as instructed by the app. Perform any other steps as instructed by the app. When setup is complete, the app will automatically progress to the first round's investigator phase. For their first game, players are recommended to play the "Cycle of Eternity" scenario. This scenario is shorter and less complex than the other scenarios, making it well suited for learning the game. 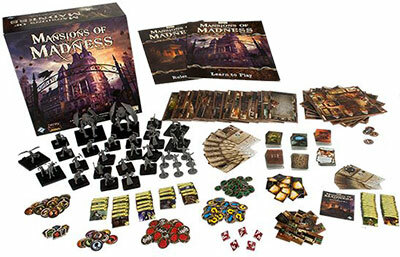 Before choosing a scenario, if you own the first edition Mansions of Madness base game and/or any of its expansions, you can integrate the components of those products as described by the Conversion Kit rules insert. 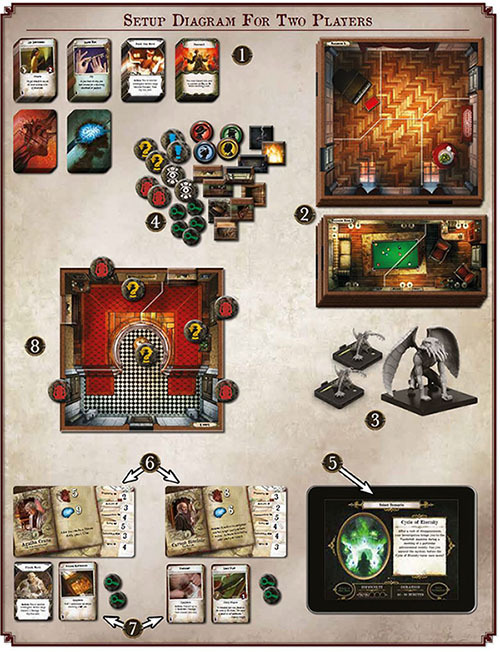 Players can play any investigators from the integrated first edition products, and the app can use any of the monsters or map tiles from those products during the game. 1 Space: An area of a map tile separated from other spaces by borders, impassable borders, walls, or doors. 2 Border: Represented by a solid white or yellow line. Borders divide large areas into multiple spaces. Investigators and monsters can move through borders. 3 Impassable Border: Represented by a white or yellow dashed border. Investigators and monsters cannot move through impassable borders unless an effect specifically allows it. 4 Wall: Represented by a brown border. Investigators and monsters cannot move through walls unless an effect specifically allows it. 5 Door: Represented by a rectangular gap in a wall. Investigators and monsters can move through doors. Investigator Phase: Investigators perform actions to move about the game board, explore their surroundings, and attack monsters. Mythos Phase: The app indicates monster actions and generates mythos effects. These effects might spawn monsters or raise other challenges that investigators will need to overcome. After the mythos phase each round, investigators start a new round beginning with the investigator phase. Players continue resolving game rounds until they have won or lost the game. These phases are described in detail on the following pages and summarized on the last page of the Rules Reference. During the investigator phase, each investigator performs up to two actions. 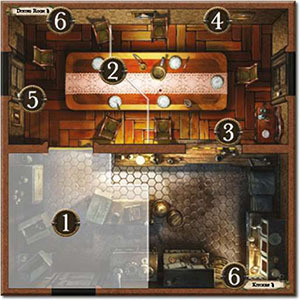 Performing actions is the primary way in which investigators move about the game board and interact with their surroundings. The investigators take turns in the order of their choice. On an investigator's turn, he performs up to two actions of his choice. Then the next investigator takes his turn, and so on, until each investigator has taken a turn. During the investigator phase, investigators can perform the following actions. The detailed rules for these actions are explained in the following sections. The investigator moves his investigator figure up to two spaces, moving one space at a time, from one space to an adjacent space. He cannot move through walls or impassable borders unless an effect specifically allows it. If an investigator attempts to move out of a space that contains a monster, he must first resolve an evade check. 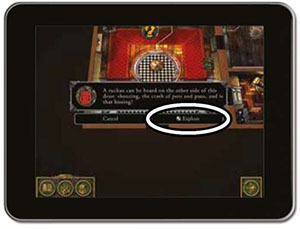 The investigator uses the app to explore an adjacent room.To do so, he taps the Explore token that corresponds to the area he wants to explore. Then he confirms his action by selecting the " Explore" option. The investigator resolves the effects as instructed by the app.The effect indicates which map tile or tiles to place as well as any Search, Interact, Person, or other tokens. 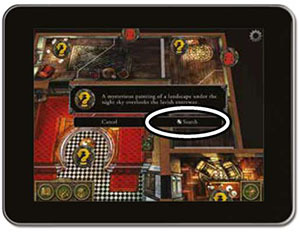 After all tiles and tokens have been placed, the investigator may move into the explored area as instructed by the app. The investigator uses the app to search something of interest in his space. To do so, he taps a Search token in his space. Then he confirms his action by selecting the "^ Search" option. 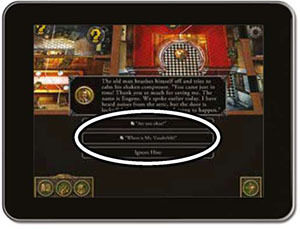 The investigator resolves the effect as instructed by the app which might include a skill test, declared as a skill icon embedded in parentheses following a short narrative. For example, "You dig through the dense paperwork cluttering the desk, looking for anything of interest ( )" instructs the investigator to test his observation ( ). The investigator may give any number of Common Items, Unique Items, or Spells to each other investigator in his space and allow those investigators to give him any number of their possessions. Additionally, he may pick up or drop any number of the Common Items, Unique Items, or Spells in his space. Performing the explore action, search action, interact action, and some component actions requires using the app. An investigator may tap any token in the app to inspect it. Doing so does not require an action, and an investigator can inspect a token even if the token is not in his space. An investigator cannot select an option that is preceded by the action icon ( ) unless he spends an action to do so. Performing the explore, search, or interact action allows the investigator to select such an option. The investigator uses the app to interact with a person or object in his space. To do so, he taps a Person or Interact token in his space. Then he confirms his action by selecting an option preceded by the action icon ( ). The investigator resolves the effect as instructed by the app which might include additional decisions or a skill test. Some components or effects allow investigators to perform component actions. Component actions are described by the component or effect that allows the investigator to perform that action. Component actions on cards are preceded by the word "Action" in bold and can be performed by the investigator who has that card. Some items allow investigators to perform a component action by using the app. 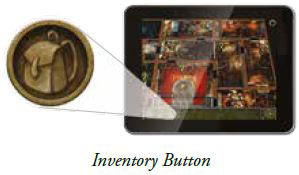 To do this, the investigator opens the inventory by pressing the inventory button in the bottom-left corner of the screen and selects the Item. Then he confirms his action by selecting an option preceded by the action icon ( ). The investigator resolves the effect as instructed by the app. The investigator uses the app to attack a monster. To do this, he selects the monster that he wants to attack from the monster drawer 1. Then he presses the "Attack" button 2. The investigator must choose how he wants to attack and confirm his action by selecting one of the following options 3 - " Attack with a Heavy Weapon", " Attack with a Bladed Weapon", " Attack with a Firearm", " Attack with a Spell", or " Attack Unarmed". After selecting his attack type, he resolves the effect-which often includes a skill test-as instructed by the app. The investigator uses the "+" and "-" buttons in the monster menu to record the damage the monster has suffered 4. To select a monster, an investigator opens the monster drawer by pressing the monster drawer button. Then he presses a monster's icon in the drawer to select it. This will open the monster menu from which an investigator can attack or evade the monster or alter the amount of damage the monster has suffered. Some effects, such as ranged attacks, horror checks, and monster effects, rely on range. The maximum range of these effects is three spaces. Range cannot be counted through walls or doors unless an effect specifically allows it. An investigator using a weapon or spell with the melee icon can attack only a monster in his space. An investigator using a weapon or spell with the ranged icon can attack any monster within range. After all investigators have taken a turn, one of them presses the end phase button in the bottom-right corner of the screen to end the investigator phase and proceed to the mythos phase. Carson Sinclair uses the attack action to attack a Deep One in his space. He opens the monster drawer by pressing the monster drawer button in the bottom-left corner of the screen and selects the Deep One. He presses the "Attack" button. Carson decides to attack with his Crowbar, a Heavy Weapon. He selects the " Attack with a Heavy Weapon" option. The app instructs him to test his strength ( ). He does so by rolling dice equal to the value printed on his card. He rolls two success results ( ) and one blank result. The test declaration in the app indicates a test difficulty of two, meaning he needs two success results to pass. Having passed the test, Carson causes the Deep One to suffer damage equal to his weapon's damage (2) plus his test result (2) as instructed by the app. Finally, Carson records the damage that the Deep One has suffered by using the app. During the mythos phase, the app generates a number of effects to be resolved by the investigators. There are three types of effects that the app can generate-mythos events, monster activations, and horror checks. These effects are described in the following sections. 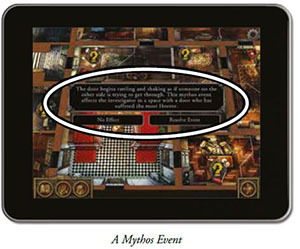 Mythos events are effects generated by the app during the mythos phase. Mythos events might be related to the specific scenario investigators have chosen or the actions the investigators have performed during the round. The investigators resolve the effects as instructed by the app. After all mythos events for the round have been resolved, the app will generate instructions for activating monsters. If there are no monsters on the board, the mythos phase will end automatically instead. The app generates instructions for activating each monster, one at a time. These instructions will describe how to move each monster and how each monster attacks. Investigators resolve the effects as instructed by the app. After all monsters have activated for the round, the app will instruct investigators to resolve horror checks. During the mythos phase, the app opens the monster menu and generates the effects of each monster's activation. The app generates movement instructions for the Deep One and specifies which investigator the Deep One attacks. 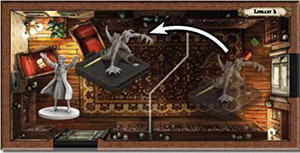 The investigators follow the app instructions by moving the Deep One toward the nearest investigator. The Deep One attacks the investigator in its space who has suffered the most Damage. Agatha selects the "The monster attacks". option, and the app generates the effects of the Deep One's attack. The effect instructs Agatha to test her strength ( ). She does so by rolling dice equal to the value printed on her card. She rolls one success result ( ) and one blank result. Unable to reroll dice or convert any other results to , she continues to resolve the effect. The effect generated by the app instructs Agatha to suffer two facedown Damage negated by the result of her test. Agatha's single negates one facedown Damage, but she suffers the remaining one facedown Damage. Having completely resolved the effect, Agatha presses the "Continue" button. The Deep One's activation is complete. 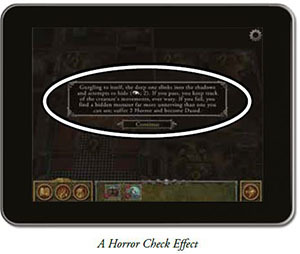 The app instructs each investigator to resolve a horror check against a single monster within range. Each investigator resolves a horror check against the monster within range with the highest horror rating. If an investigator is not within range of any monsters, he does not resolve a horror check. To resolve a horror check against a monster, the investigator selects the monster from the monster drawer and resolves the effect as instructed by the app. 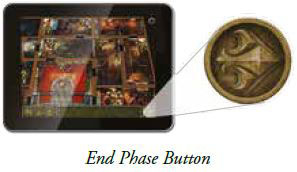 After all investigators have finished resolving horror checks, one of them presses the end phase button in the bottom-right corner of the screen to end the mythos phase and begin the next round, starting with a new investigator phase. During setup, players select a scenario that determines what the investigators need to do to win the game. However, this objective is hidden from the investigators. 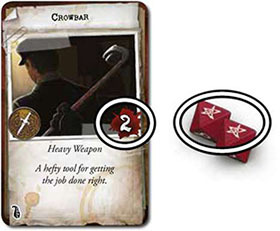 During the game, the investigators must unravel the mystery and discover their ultimate goal. The investigators can do so by listening carefully to the scenario's prologue and carefully examining each hint they discover throughout their investigation. After the investigation has progressed enough, the objective will be revealed, giving the investigators one final task to complete the investigation. Investigators win the game when the investigation is complete. If the investigators take too long to complete the investigation, the scenario's objective might change or become more difficult to accomplish. If the investigators continue to take too long, investigators will lose the game.